The Live Your Dream Education and Training Award is Soroptimist International of the America's signature award program supported by clubs like ours throughout the Federation. 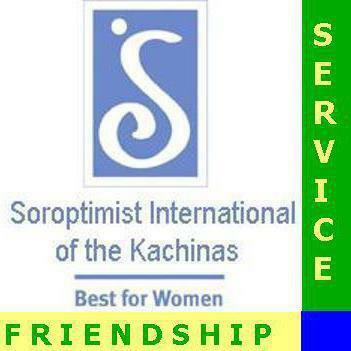 Soroptimist International of the Kachinas gives a cash award annually to a woman who is the primary financial support of her family (children, spouse, or parents) and who is enrolled in, or has been accepted to, an undergraduate degree program or a vocational/skills training program. Applicant must demonstrate financial need and must not be seeking a graduate degree. Unlike a traditional scholarship, this award is given to the woman to use as she chooses. The minimum award amount is $1,000 and the winner is eligible to receive awards at the Region and Federation levels of $3,000 and $10,000, respectively. Contact us at sikachinas@soroptimist.net for an application or you may download the Live Your Dream Award Application with instructions and the required Reference Form from the Soroptimist International of the Americas website. Please note: You must save the forms to your computer and open them in Adobe Acrobat. If you fill them out in your browser window and save, the information you type in the form will not save! Renie Branham Woman of Courage Award is given annually to a woman who shows outstanding character in the face of personal adversity. The award was named for one of our club members who showed extraordinary courage when faced with a cancer diagnosis. Since 2003, the club's Kachina Award has recognized and honored individuals who consistently demonstrate outstanding advocacy and service dedicated to improving the lives of women and girls in our community. Past award winners included distinguished Soroptimist dignitaries Vicki Peña and Alice Wells.